I'll be sewing the delectable mountain borders on this week. I wish I had a bolt of this fabric. 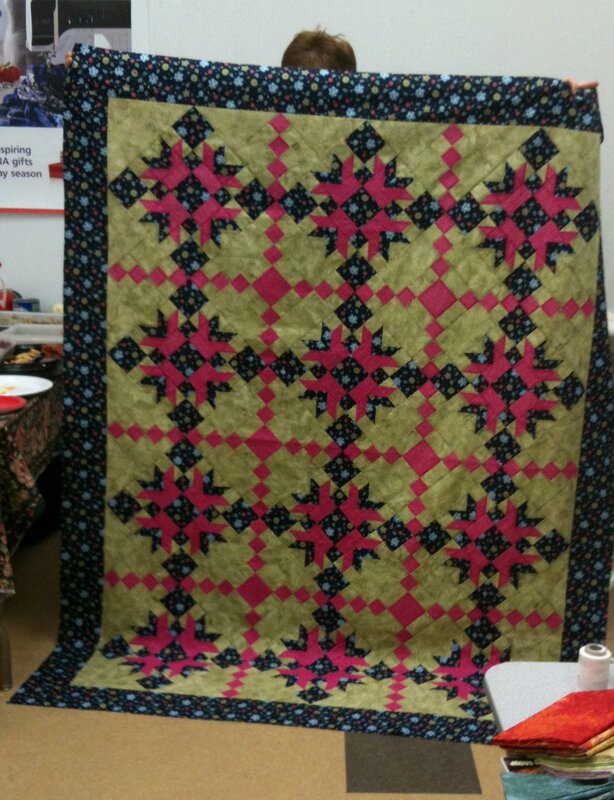 In December the monthly quilting club I attend tackled a mystery by Debbie Caffrey. Her mysteries are very popular so I know many of you are familiar with them. 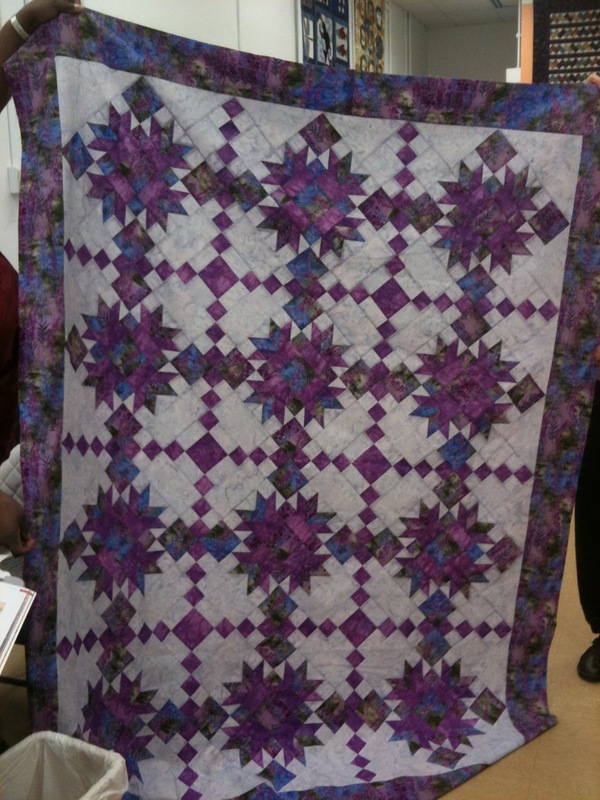 Here is parade of the quilts made by our group. Hiding behind this quilt is the woman who started it all...our leader, Marcia. We got to see her version with about 2 hours left in our 5 hour session. There was lots of homework. And here's my version with my son Zack and his girlfriend, Lindsey. Zack has patiently waited for me to finish this quilt and now it covers him at night. He wanted to get a picture of it in front of the bear rug hanging on our great room wall but I didn't really show too much of the bear...I think a beautiful quilt would look so much better hanging on that wall but I pick my fights! This mystery is called Cat's Meow. We just started one of her free patterns from the website last week called Rancher's Daughter. It's going pretty fast...simple but effective pattern. IS the best part of getting together with quilting friends. There were only eight of us but lots to see. Several of the ladies brought their projects from last month since I was gone...so glad they did! Here's Cathy...She had sew much to share! A stack and wack beauty on hand for gifting. This is the back...Cathy is what I call a two-fer-one quilter as her backs are quite often as lovely as her front. This is the back of Cathy's next quilt...see what I mean. And the front of Rosie the Quilter. And this colorful quilt was a guild mystery from some time ago that Cathy finished. This is the pattern Christmas Ribbons from Kim Brackett's book, Scrap-Basket Surprises. The Christmas colors didn't call to me when the group took this one on but I am rethinking it after seeing Cathy's version. Next up is Melody's baby quilt...with a story. Melody brought a stack if Yellow Brick Road blocks last month that were done in brights. When she put them up on the design wall she wasn't happy. Her fix was to cut up the blocks and sash them. I love a happy ending! My special name for Melody is the bag lady...and I mean that in the nicest way. Melody is a machine embroiderer and she has made many gorgeous bags embellished with embroidery. This is the bag she made to bring her show and tell to class. I really need one of these! Barbara brought in her applique sampler. Sew Springy. Then we have Erin who usually works in country colors. She had two quilts this time that were way out of her usual colorway. This is also from Scrap-Basket Quilts, Bali Sea Stars. A very lucky niece is getting this one. This is Erin's version of January's project, McGuffey from Carrie Nelson's Schnibbles Times Two. This beauty will also be a gift for a newly married couple who like red, white and black...perfect. Which leads me to the last two photos I'm sharing today. For Valentine's Day our leader handed out appropriate strips for all in attendance to make a McGuffey runner. 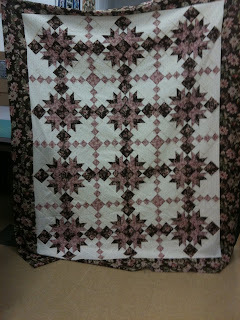 Her is Marie with her finished runner...quilted with a big heart in the center of each block. I'll share the mystery quilts tomorrow...I gotta go! Tomorrow is Breakfast Club...my monthly quilting gaggle gathering. I missed January's so I'm really looking forward to it. I plan to bake some cookies today and finish cutting out my fabrics for the new quilt. The pattern has a background fabric with 12, 1/4 yard fabrics. I feel the need for some color! We are doing a Debbie Caffrey pattern, Rancher's Daughter. Looks like a piece of cake! Nine patches and delectable mountains. I've got my IditaQuilt star blocks cut out...now marking all the blue 2 1/2" squares diagonally...there are 96 star units and 68 pinwheel stars to make. I'll load a light gray aurofil thread in my machine and work between both projects. Made a little scissor fob with my leftovers to match my lime green scissors. I need to make one more for my lime green rotary cutter! I have a lime green Tutto sew machine trolley so I feel very accessorized. But what would I do without them? Not much to post when that happens so I'm hoping this Monday starts a new week of more accomplishments. Finished the quilting on my Hawaii batik quilt. Here's my template I used to trace with a chalk pencil. The template I made was too big... I had to drop the bottom set of leaves but I'm keeping it for a future project. I'll reveal the full quilt design when it's time to share completed UFOs because I'm getting this one done! So...what's on the design wall? Here's my theme fabric! I am sew excited about this quilt. The Iditarod starts March 5th and the last musher should be to Nome a couple of weeks later. My goal is to completely finish my quilt by then. I might even share some Iditarod trivia along the way. I definitely have to pick a musher to follow. My favorite movie is "Shakespeare in Love." You remember reading Romeo and Juliet in high school... I re-lived that freshman English class when my sons went through it...especially my youngest who had it 2 years ago. I read most of the play with him to help him decipher the meaning of William Shakespeare's prose. Last night I found out that lesson made it into his brain! He shared with me a video he watched in his junior English class. Reduced Shakespeare Company. I hadn't heard of them. He pulled part of the video up on You Tube and laughed like crazy. His comment...."You could tell who never read the play because they didn't get the jokes..."
William Shakespeare entertains another generation...priceless. I had a great day...wonderful walk with the dogs in the sun...clear blue skies...snow covered terrain and the trails to ourselves. I also pretty much ignored chores and hung out in the sewing room (that means playing catch-up on Wednesday). I finished the handwork on an applique block. This is part of a Moda U quilt from a couple of years ago. Here are the other blocks I've finished so far. There are several more blocks to applique and then pieced blocks to add. I am hoping to just get the applique work done over the course of this year and then next year put it on my new list of UFO's because I'm just sure I will get all of this year's list taken care of! I made a long list last Monday...I think it will take at least another week to put a dent in it! 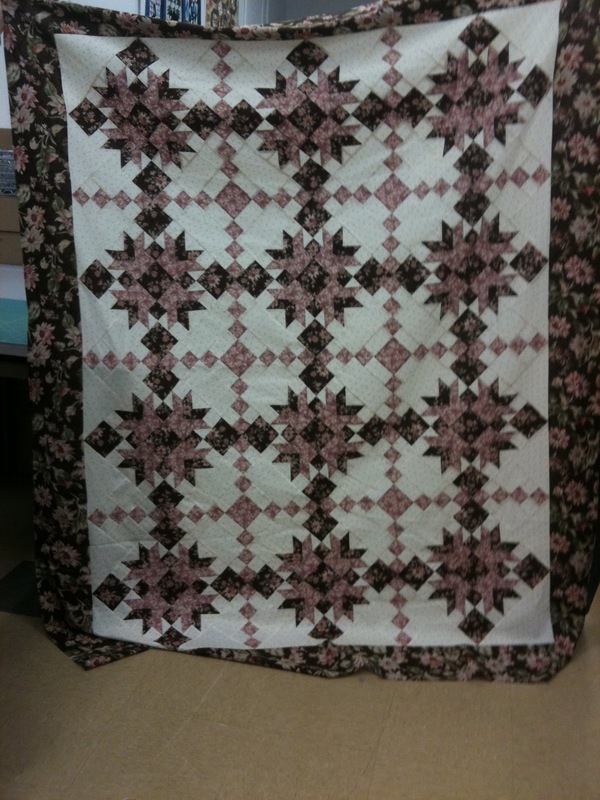 I did finish my little McGuffy quilt designed by Carrie Nelson. Such a fun and easy pattern. I hope to make my batik version in queen size someday! Cleaning...it never ends. I moved from the sewing room to other areas of the house...I still had some "winter" decorations up that I decided to go ahead and put away even though it is definitely still winter at my house. Time to put Frosty away until next year. My newly ordered thread arrived...maybe this weekend I will get to saturate myself in color. Next week there are - (MINUS) temperatures in the forecast. Thankfully my neck of Alaska doesn't get a lot of that really cold stuff...teens and twenties are just right. But we do get a few streaks of bitterly cold days...this should be the last of it...really! My sewing room is getting cleaned...which means not much else is getting done. I just had to take a break and do block 8 from the Layer Cake Quilt Along. This was a fun and quick block to make. You could create chains in your quilt if you alternated this block throughout the top. I like it. Here's where we are after 8 blocks. Applique is the word of the week. I have finished the applique on the stocking so now I need to hand quilt it and the back piece. I pulled out 2 blocks from in-progress patterns. I didn't add them to my UFO list because I thought it would be unrealistic to finish them in a month...so I will try and get at least one block a month done from both projects. I plan to quilt and bind this small quilt. This quilt needs binding and the quilting threads tied and buried. And finally...there will be some BOMs from the web to work on if I get all of that done. Whoo Hoo! 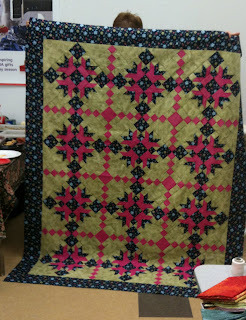 Finished quilting the Debbie Caffrey mystery. I had a tension issue early on...turns out I had a thread looped on the tension disk...no idea how that happened but I learn something new all the time. I used Dream Puff for the batting...a 100% polyester batting that can be quilted up to 10" apart. This won't be an heirloom but a well used quilt for my 16-year-old son. Not a huge fan of the 100% polyester content but considering it's use I think it's a good choice. I do like the way the quilting looks with this batting and it's a dream to work with. My son checks daily in the quilt's status so hopefully I will get the binding on soon. I always have the urge to add on...but I see this quilt being given as a gift someday so lap-size is the most practical. Those big spaces of floral batik are crying for some fun quilting. and the "rec" room really should be called a "wreck..."
But I sure have gotten a lot done!